Former Senator Juan Ponce Enrile, the brain of Martial Law reminds the youth during the occasion of the late President Ferdinand Marcos’ 101st birthday that the country owes him its democracy. Had he not declared military rule as per Enrile’s recommendation as the defense secretary at that time, the Communist Party’s founder Maria Sison could have been the current ruler like in Cuba and North Korea. 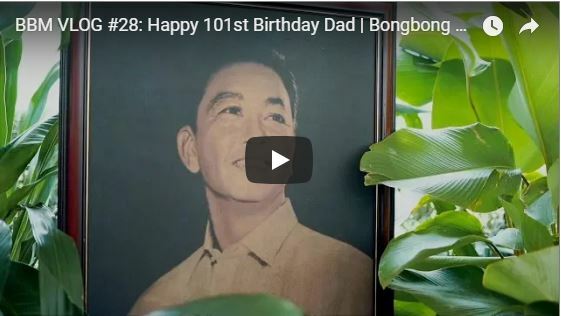 [VIDEO]: It’s heartwarming to see our supporters come together year after year to help celebrate my father’s birthday. On the 101st birth anniversary of the late President Ferdinand Marcos, the whole family was present. Bongbong Marcos shared pictures of the gathering on his Instagram. Also, on his vlog, he showcased the achievements of his father. Quoting Marcos, “101 years ago, one of this country’s greatest leaders was born. Today we celebrate his life as well as his enduring legacy. He aspired greatness for this country and it was born out of a strong belief that Filipinos are capable of achieving it,”. Among the family and the Marcos loyalists present, was Irene, the former First Lady Congresswoman Imelda Marcos, and the grandchildren. Marcos Further says, “As citizens of this great nation, we should not waver in our pursuit of greatness. In doing so, we honor his memory. Happy Birthday, Dad!” The Marcoses always believe in the capabilities and talents of Filipinos. Not only Marcos loyalists were present on Ferdinand’s 101st birthday. In a stark contrast, Dozens of anti-Marcos folks bore scathing placards against him outside of the cemetery. Despite their limited number, their efforts are magnified through the mainstream media that has misled the public for many years. They capitalize on the abuses under the martial law regime and blamed the alleged atrocities on the deceased leader to discredit the son. Quoting retired Justice Manuel ‘Lolong’ M. Lazaro, “Succeeding administrations have inordinately used laws and the media to destroy or consign Marcos to oblivion, notwithstanding his solid unprecedented achievements for the good of the nation and its people,”. We should all keep in the record not only the wrongs but also the achievements and contributions of Marcos. We must not distort history by obliterating these achievements that should be attributed to him. Like the late President Ferdinand Marcos, Du30 always seek closer ties with China. He just met with Chinese President Xi Jinping for a forum discussing business and other cooperation matters where he announces the country’s partnership with the Chinese people. This is despite the resistance of the opposition and the oligarchs due to the South China Sea dispute. However, the Filipino leader found an ally in the former Senator Juan Ponce Enrile. He agrees with the President’s strategy of befriending China. If Marcos’ detractors did not resist his Bataan Nuclear Power plant project previously, Philippines can give a finger to the latter, he said. Therefore, blame the resistance that stops the progress of the country. Not the President, he added. One more thing, befriending North Korea’s ally makes Filipinos safe from any nuclear war threat. 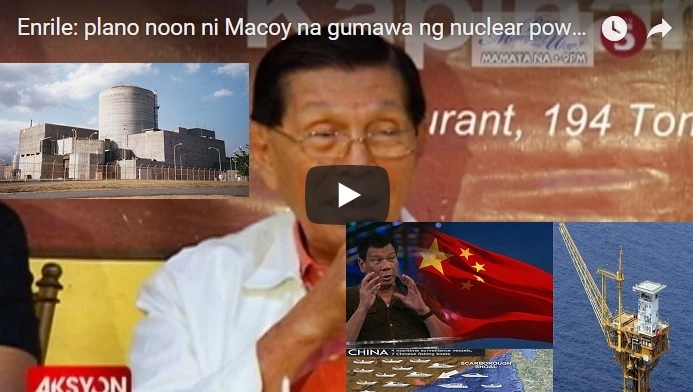 [VIDEO]: Isiniwalat ni Sen. Juan Ponce Enrile na plano ni dating Pangulong Ferdinand Marcos na bumuo ng nuclear weapon. Aniya, Isa raw ito sa top secret ni Macoy noon. 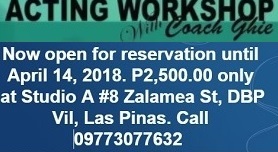 Iginiit pa ng dating senador na kung natuloy lang daw sana ang proyektong iyon, malamang magdadalawang isip ang China na i-bully ang bansa kaugnay sa West Philippine Sea. Ulat hatid ni Martin Andanar. In March 2017, Philippine and Chinese officials sign the Six-Year Development Program (SYDP) for trade and economic cooperation. This is along with other agreements for two major infrastructure projects in the Visayas and Mindanao, under the “Build, Build, Build” program. They are also looking into possible preliminary studies for the Davao Expressway, and bridges connecting Panay, Guimaras, and Negros islands. China now reviews loan applications for infrastructure priority projects. This is for the $53.6-million Chico River Pump Irrigation Project in Cagayan and Kalinga provinces, the $374-million New Centennial Water Source-Kaliwa Dam Project in Quezon province, and the $3.01-billion south line of the North-South Railway. The South China Sea is one of the most disputed regions in the world. China, Vietnam, Taiwan, Malaysia, Brunei and the Philippines have overlapping claims there. China has built artificial islands on the Paracel and Spratly island groups as part of its nine-dash line ownership claim in the area. Du30 said he might bring up the issue of the West Philippine Sea with Xi. But it should not intrude now in the business of exploration and development. The anti-oligarchy Filipino leader who has a genuine pride of a sovereign country does not tolerate colonial mentality. That is what he has in common with the late President Marcos. Dictatorship can never happen in the Philippines. All major decisions must go through the Senate and the Congress. This is why the very able soon to be lady Senator Imee Marcos vows to work behind the good President Du30. Under the leadership of President Rodrigo Roa Du30, the projects of former President Marcos are continued. They were halted during the 1986 power grab by the Aquinos. Special Presidential Assistant Bong Go is a good bet for the Senatorial race to ensure that the Build Build Build initiative of the President can progress as planned. Senator Nancy Binay is also key to the nuclear power plant revival. It can serve areas that are not provided with enough electricity from the Meralco monopoly. Natural energy developments like solar, windmill and others can mushroom very soon. Most of all, the deuterium exploration and extraction can finally see the light. The Philippines is definitely the home of clean Hydrogen fuel of the future should the DOE jives with the President’s wishes and not be corrupted by the oligarchs. Former Senator Juan Ponce Enrile remains the keeper of the truth about the late President Ferdinand Marcos whose reputation is tarnished by black media propaganda. The Press people who fail to research deeper cannot understand why he was a major player in the EDSA event. The constant use of the words; loot, corruption, ill-gotten wealth, martial law abuses, disappearance, tortures, and others clouded Marcos’ leadership. Now that Enrile hands over Marcos’ diaries to his son, Bongbong Marcos, it signifies that he’ll soon lead. It, however, comes with a warning about the leftists and Liberal Party crusaders. 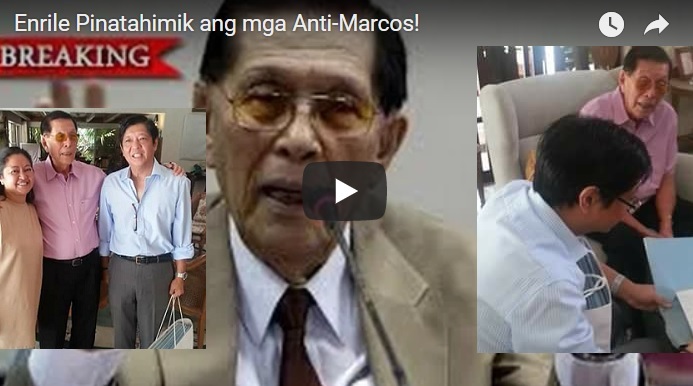 [VIDEO]: Enrile Pinatahimik ang mga Anti-Marcos! Most local and international media bear misleading titles when it comes to the late Ferdinand Marcos. The title dictator alone does not exist in a democratic country. They keep on repeating that Marcos reportedly amassed a fortune of $5-10 billion, despite earning an official annual salary of just $13,500. The former First Lady’s 1,220 pairs of shoes become the symbol of the family’s alleged kleptocracy and crass extravagance in contrast with the extreme poverty in the country. The family has always denied any wrongdoing. The Marcoses’ claims are consistent with legal records. Marcos was already wealthy before he became president. His wife also supported the Marikina shoe trade that is now dead because of the wrong news. …Freddie Elizalde showed me a copy of an editorial which Chino Roces wanted to be pooled by all the newspapers castigating me and asking for my resignatio and that of the cabinet. For good measure the editorial included the Vice-President. It was opposed by Freddie and Ugarte. And Teddy Locsin opposed the demand for resignation. …The timetable is being pushed too fast by the leftists. It may be earlier than we think. …The Liberals have taken out a full page advertisement on martial law declaring they would not attend sessions if martial law is declared. …I have also said that if we do not now take measures of self-preservation, this will come about. So if there is going to be an inevitable collision, then perhaps we should induce it now while communists are weak and disorganized. The will of the late President is about to happen with his family now gaining a political stronghold in the country. Bongbong Marcos’ protest against Vice President Leni Robredo is to be resolved through a recount. Bihomadu, the President’s true alliance who are all for Bongbong Marcos’ future leadership is now in full gear after the recent meeting of RAM members including Senator Gringo Honasan with Du30. Mainstream media still insists that the military mutiny led by Honasan and Enrile was to topple the late Ferdinand Marcos. Good thing, they still exist to straighten out the wrong belief. EDSA happened because they want to save the people – with the blessing of former President Marcos. [VIDEO]: Kasama ng Senador ang ilang miyembro ng Reform the AFP movement (RAM). President Du30 met with Senator Gregorio Honasan and members of the Reform the Armed Forces Movement (RAM) in Malacañang recently. Also present during the Tuesday meeting were RAM officers including retired Capt. Felix Turingan, resigned Capt. Glen Agudo, retired Navy Commodore Rex Robles, retired Col. Marcelino Malajacan Jr., retired Col. Hernando Caraig, retired Col. James Joven, retired Police Director Victor Batac, and Engr. Jegie Pereda. 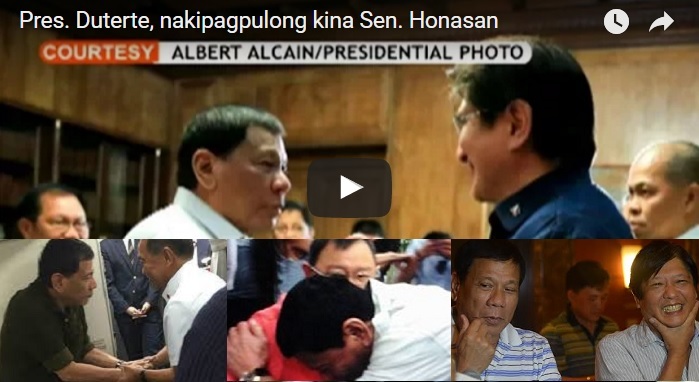 The senator’s meeting with the President came after he was indicted for graft and posted bail for alleged misuse of pork barrel funds. He surrendered voluntarily and paid a bail of 60,000 Pesos after pleading innocent. The former Vice President Jejomar Binay and his son were also indicted by the Ombudsman prior to that due to the alleged Makati building anomalies. Binay ran for President in 2016 with Honasan as Vice President. However, the tandem endorsed Bongbong Marcos as Vice President which the Binay Camp still pushes through the electoral protest evidence they help gathered under the disclosure of Pastor Boy Saycon. Du30 didn’t win just because he is popular. He is very strategic as well. When Binay was asked by ex-Pnoy to block Marcos and Duterte from their aspired posts, he forged an alliance with the President Du30 because he already knew that the media propaganda against him already ruined his chances. Both of them intend to make Marcos the President at the soonest possible time. That’s the common goal of the Bihomadu group. Bihomadu is the Binay, Honasan, Marcos, and Du30 alliance. They were first organized secretly during the elections. Members aim to block the Liberal Party members in the top posts. Du30 beats Mar Roxas but Marcos’ fight with Robredo is still ongoing. With regards to the historical revisionism that the yellow faction heavily campaigns for, it is actually their way of stopping the truth to come out. A shout out to the media practitioners who support the truth. The key witnesses in the person of Binay, Honasan, and Enrile are still alive to tell their side of the story. Time to take advantage to the real scoop as far as EDSA People Power is concerned. 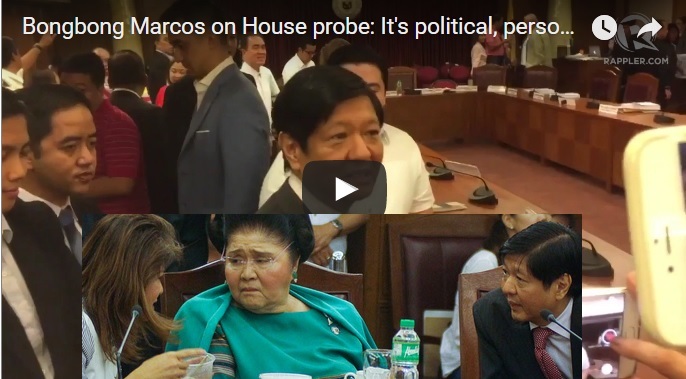 Bongbong Marcos thinks that the investigation at the Congress is merely motivated by politics. “It started off that way. I think it’s gone beyond that.” He and Ilocos Norte 2nd District Representative Imelda Marcos were also at the hearing. Governor Imee Marcos was with her legal counsel, former Senator Juan Ponce Enrile. [VIDEO]: The former senator and Ilocos Norte governor attend the hearing to support his sister, the incumbent governor of the province. Former Senator Ferdinand Marcos Jr. questions why the issue “ended up in the House” in the first place. “I am not sure why it ended up here in the House of Representatives. It’s a political conflict in Ilocos Norte that turned into a personal one,” said Marcos. He is also a former governor of the province. His sister, governor Imee Marcos is the subject of a probe into the alleged misuse of the funds to purchase motor vehicles. Marcos is not alone in his opinion. “I think you can ask the Ilocos 6 what they think of that,” explained Marcos Jr., referring to provincial employees who had been detained by the House of Representatives in late May 2017 who just gave the best answers they possibly knew during the hearing. The hearing was initiated by Majority Speaker Rodolfo Fariñas, who represents the first district of the province. It is evident in the Congress hearing video that he is too emotional and personal to conduct such investigation. He can’t be fair when his reputation is also in the line. At one point, Gov. Marcos and he debated on using their names in local projects. He only escapes confrontation as he has the power to turn his wrath into the other members of the Ilocos 6. Farinas approached and spoke briefly with Governor Marcos, Representative Marcos, and Enrile. Fariñas had his back on Marcos Jr., who stands a few seats away from his mother. The majority leader acted surprised as he bumped into the former Senator. Is Farinas’ grudge rooted from the brother and not the sister?